Concerns about crossing 30th Avenue east of Hilyard Street have been submitted to the City of Eugene for several years. Many of these concerns have been on behalf of students attending Camas Ridge Elementary School (1150 E 29th Ave) which relate to the convenience and usability of the pedestrian bridge, high speeds along the corridor, and previous crashes. The current pedestrian crossing bridge is difficult for families with strollers or bicycles (especially those with tag-along trailer bikes or other loads and small children on their own bicycles) to use the existing structure that was designed for pedestrian access and retrofitted to accommodate adults pushing regular sized two-wheeled bicycles. In response the city began the process in May of collecting data and holding a public meeting to collect community comments. Since then, city staff have evaluated the corridor and developed a recommendation for improving the crossing. A meeting to discuss bicycle and pedestrian crossings of 30th Avenue from Harris Street to University Street in south Eugene is scheduled for Thursday, October 3rd at 6:00 pm in the Cafeteria at Camas Ridge Elementary School located at 1150 East 29th Avenue in Eugene. The purpose of the meeting will be to discuss community input, describe results of evaluation studies, and present the city’s recommended improvement option. For more information see the city website at www.eugene-or.gov/30thcrossing or contact Reed Dunbar, Transportation Planner, at 541-682-5727. Blackberry bRamble; A Weekend of Bike Fun! The annual Blackberry bRamble & Bike Celebration is just a few days away and it’s filled with a whole weekend of fun bike-centered activities. Here’s the basic run down of the weekend. Be sure and register now for the rides, the price goes up on Friday! The Blackberry bRamble has long been known for its scenic route, extraordinary food at rest stops, reliable support and free blackberry pie and ice cream at the finish. Whether you’re a road cyclist in top form, a weekend recreational rider, or a parent pulling two kids in a trailer, Eugene’s Blackberry bRamble is a great ride! Plus, all proceeds from this event support Safe Routes to School and bicycle education in the greater Eugene area. But there is much more the bRamble than the rides; from special industry tours, a fundraising dinner for adaptive recreation, a speaker, pedal powered movie in the park, breakfast, and a post-ride celebration there is a lot fun to be had the whole weekend! 6-8:30 Spaghetti dinner in Hilyard Community Center (beer garden on the patio). 7:30 – 9:00 GEARs meeting and guest speaker at Hilyard Community Center. 9:00ish – 11:00ish Movie in the park at the festival area behind Amazon Pool (Pee Wee Herman’s Big Adventure). Meet other riders at the community dinner, where you can enjoy all you can eat (not to be confused with all you should eat) pasta, salad, bread, dessert and a beverage. The Beer and Wine Garden will be open for purchases for those wanting a little pre-ride pick me up. Tickets can be purchased now, or on site on the evening of the dinner. All proceeds from the community dinner go to support Eugene’s Adaptive Cycling Program. In the Hilyard Community Center, Ellee Thalheimer, author of Bicycle Sojourners, will share with you the joys of touring and her experiences touring in Oregon. The evening will end with a Movie in the Park presentation of PeeWee’s Big Adventure, a classic cycling movie. Ellee Thalheimer is an accomplished freelance travel writer and cycle tourist who believes that there are few better ways to travel and discover than by bike. Co-founder of the non-profit business alliance thePortland Society, owner of Into Action Publications, zealous Oregonian, author of Lonely Planet’s Cycling Italy and drinker of yerba mate, Ellee rarely turns down an adventure. Her most recent projects include authoring and publishing Cycling Sojourner: A Guide to the Best Multi-day Tours in Oregon and co-authoring and publishing Hop in the Saddle: A Guide to Portland’s Craft Beer Scene, by Bike. When away from Portlandia, she misses the bejeezus out of her husband Joe and her puppy dog Winston. Sunday, August 4th- The Big Day! Fuel up before the ride. A continental breakfast with prices ranging from $1.00 to $5.00 will be available at the Hilyard Community Center. If you are not ready for a full breakfast, enjoy a free cup of coffee (6:30 – 9:00 am). Those of us living and riding in the Eugene/Springfield area have a wonderful problem on our hands. There are so many advocacy organizations in our area working to improve our lives that it’s almost impossible to keep track of them all. It can be difficult to see how these organizations fit and work together, and which is responsible for what. Well, luckily for you gentlefolk, WeBikeEugene has come to the rescue! Last spring we circulated a questionnaire to as many of the local advocacy groups we could, and most of them answered back. From this we have created the Eugene Area Advocacy Primer. The primer is a multi-part series which will run more-or-less weekly whenever we can throughout the rest of summer, and cover organizations such as GEARs, The BikeLane Coalition, The UO Bike Program, Safe Routes to School, The BTA, and point2point Solutions! If you’d like us to cover an organization that is not listed here, let us know! Part II of this series covers The Eugene Safe Routes to School Program. The Eugene program is managed by the very busy Shane MacRhodes, who also sits on the Bicycle and Pedestrian Advisory Committee (BPAC), is a GEARs board member, WBE contributor, and driving force behind Kidical Mass – for starters. 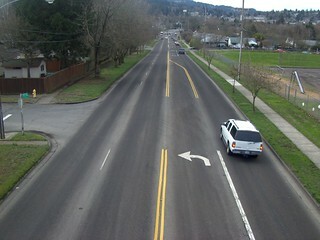 Take the jump so see all that Safe Routes to School does for cyclists in Eugene, children and adult commuters alike. Those of us living and riding in the Eugene/Springfield area have a wonderful problem on our hands. There are so many advocacy organizations in our area working to improve our lives that it’s almost impossible to keep track of them all. It can be difficult to see how these organizations fit and work together, and which is responsible for what. Well, lucky for you gentlefolks WeBikeEugene has come to the rescue! Last spring we circulated a questionnaire to as many of the local advocacy groups we could, and most of them answered back. From this we have created the Eugene Area Advocacy Primer. The primer is a multi-part series which will run more-or-less weekly throughout the rest of summer, and cover organizations such as GEARs, The BikeLane Coalition, The UO Bike Program, Safe Routes to School, The BTA, and point2point Solutions! If you’d like an organization covered that is not listed here, let us know! I’ve chosen point2point Solutions to kick off this series. point2point Solutions is the organization behind the “Drive Less, Save More” campaign last April and the Business Commute Challenge last May. They are also responsible for the incredibly useful KeepUsMoving.info website which updates commuters on construction that may affect them. The following post first appeared on the Eugene Safe Routes to School blog and is reposted in full here, courtesy of Shane Rhodes. May is Walk + Bike Challenge Month and throughout Oregon 135 elementary and middle schools and 19 high schools and colleges are registered for the event which is in its 3rd year. This is the first year that Eugene/Springfield schools are joining in the competition and there are 12 elementary and middle schools registered: Cal Young, Camas Ridge, CÃ©sar ChÃ¡vez, Edgewood, Family School/ATA, Homesource, McCornack, Network Charter, Path Finder Program, Ridgeview, River Road, Roosevelt, Thurston Elementary, and Yujin Gakuen.